Optical interference plays a prominent role in scientific discovery and modern technology. Historically, optical interference was instrumental in establishing the wave nature of light. Nowadays, optical interference continues to be of great importance in areas such as spectroscopy and metrology. Thus far, the physical optics literature has discussed the interference of optical waves with the same single frequency (i.e., homodyne interference) and the interference of optical waves with two different frequencies (i.e., heterodyne interference), but it hardly ever deals with the interference of optical waves whose frequencies are continuously modulated (i.e., frequency-modulated continuous-wave int- ference). Frequency-modulated continuous-wave (FMCW) interference, which was originally investigated in radar in the 1950s, has been recently introduced in optics. The study of optical FMCW interference not only updates our kno- edge about the nature of light but also creates a new advanced technology for precision measurements. This book introduces the principles, applications, and signal processing of optical FMCW interference. The layout of this book is straightforward. Chapter 1 gives a short introduction to optical FMCW interferometry by considering the historical development, general concepts, and major advantages provided by this new technology. Chapter 2 focuses on the principles of optical FMCW interference. Three different versions of optical FMCW interference- sawtooth-wave optical FMCW interference, triangular-wave optical FMCW interference, and sinusoidal-wave optical FMCW interference-are discussed in detail. Moreover, multiple-beam optical FMCW interference and multip- wavelength optical FMCW interference are also discussed by this chapter. 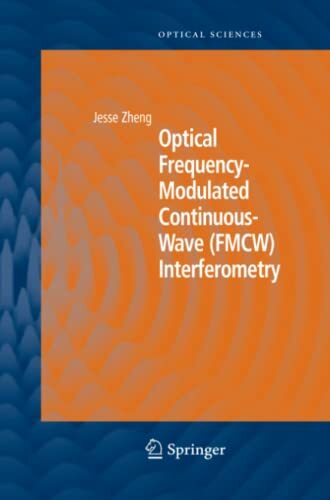 This book introduces the optical frequency-modulated continuous-wave (FMCW) interferometry - a new field of optics that is derived from radar. The study of optical FMCW interference not only updates our knowledge about the nature of light, but also creates an advanced technology for precision measurements. The principles, applications and signal processing of optical FMCW interference are systematically discussed. This book is intended for scientists and engineers in both academia and industry. It is especially suited to professionals who are working in the field of measurement instruments.